All Your Docs, Anytime Anywhere! Get All Your Docs, Reports, Bills & Invoices Anytime, Anywhere and Using Any Device Online. Get your stuff in GetMyDocs and get to it from your computers, phones, or tablets. View or Download from anywhere. Even if your phone goes for a swim, your stuff is always safe in GetMyDocs and can be restored in a snap. GetMyDocs secures your files with 256-bit AES encryption and one time password verification..
Work with your team like you are using a single computer. Everythings automatically private. 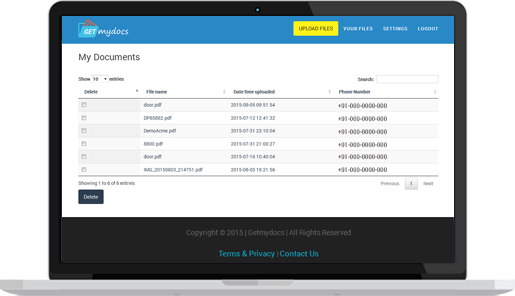 With GetMyDocs for Business, get the power and security of GetMyDocs plus robust admin controls, dedicated support, and all the space you need. Contact us to Learn More about GetMyDocs for Business. Replacing a Paper Process Businesses are saving millions of rupees annually when adopting paperless work processes by using GetMyDocs. Many industries are realizing the value of enterprise file management and share solutions. Significant paper and printing costs are eliminated, while productivity is instantly increased. 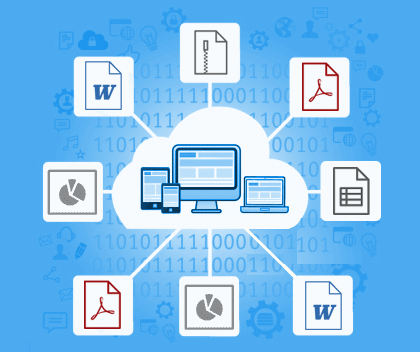 Driving a Business Process Enterprises rely on their file management and share solution to support flexible business workflows to achieve profitable interactions with both internal and external stakeholders. Business content often travels through multiple processes, which could bottleneck or create vulnerabilities without proper enterprise level security for creation, collaboration and approval stages. GetMyDocs supports varied business ecosystems and offers a centralized access and collaboration point for all content. Saving on expenses associated with hardware and supplies (paper, ink, toner, etc. ), printing and power consumption and waste. Increasing IT productivity by eliminating the many drawback of email or other sharing solution, including latency, data leakage and hidden costs. Reducing the time spent on traditionally time-consuming, complex processes by providing GetMyDocs and enabling a single access point for all content. Eliminating all performance and security risks by replacing existing access Via Secure Access Gateway. GetMyDocs helps us to communicate with our customer with ease of access and flexibility of sharing. Other salient features of GetMyDocs are truly amazing. GetMyDocs is absolutely amazing!! Its so helpful. Before I knew about it I was living in a world of email attachments and difficult to use technologies. Moving to GetMyDocs changed my daily work life. We absolutely love GetMyDocs. It made us very happy because we save significantly on cost due to reduction in paper work with delivering extra happiness to our customers.